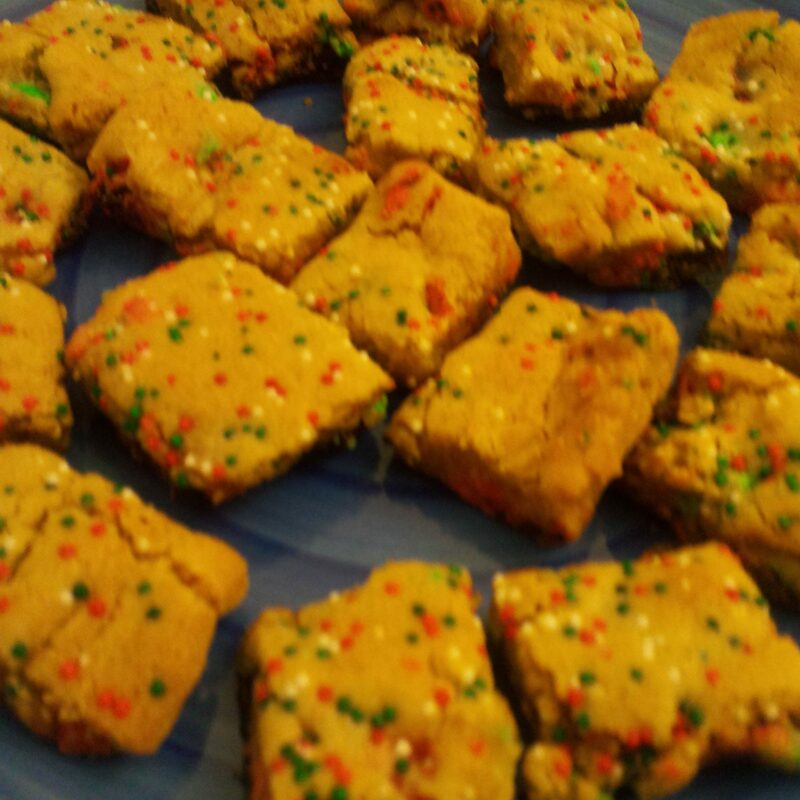 Previous: Holiday Treat #9: Peanut Butter Filled Chocolate Crinkle Cookies! Wow, does time fly! It feels like just yesterday it was pre-Christmas and I was baking all these treats. Alas, it is now post-Christmas. Life has gotten in the way of my posting a little bit, so I will do my best to catch up– I’ve been baking up a storm! I LOVE Blondies. 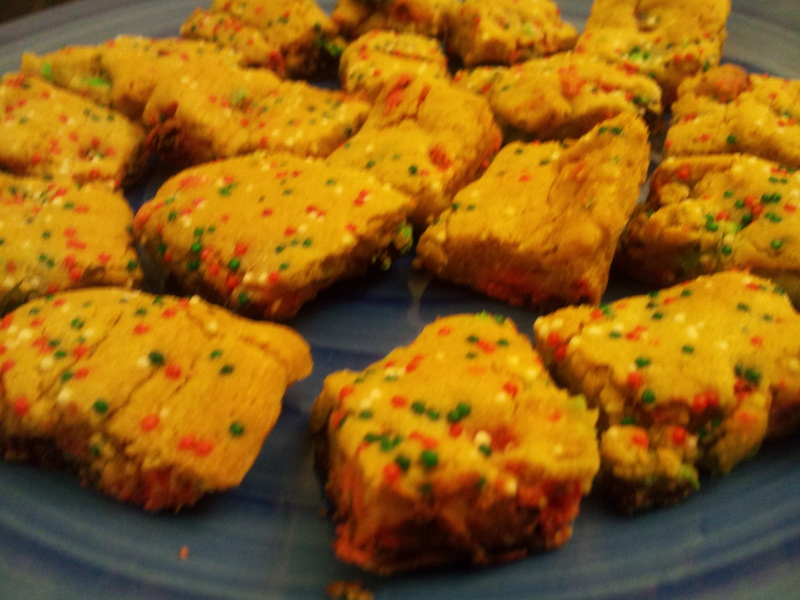 They taste like raw cookie dough, but they’re cooked! To make them festive for Christmas, I mixed in red and green M&Ms and sprinkled red, green, and white sprinkles on top! What’s great about blondies (vs. cookies) is that you just spread the batter into your jelly-roll pan, put it in the oven, set the timer, and you’re done! Cookies take a lot longer because you have to scoop out each individual cookie, and then likely have to bake multiple batches. You can whip these up from start to finish in about half an hour, making them the perfect treat if you’re pressed for time. 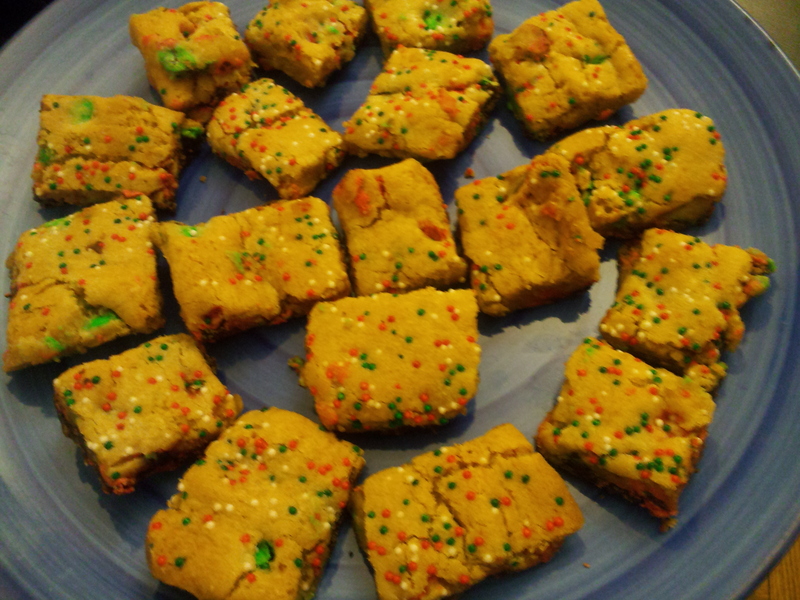 I cut them into small-ish bars and got about 4 dozen. Great for parties and sharing! 1) Preheat oven to 350 degrees F. Line a 15×10 inch jelly-roll pan with foil (for easy clean up!). Spray the foil with baking spray. Set aside. 3) In a large bowl, beat together the butter and brown sugar until smooth and creamy. Add in the eggs and vanilla and beat until well combined, using a rubber spatula to scrap down the sides of the bowl as necessary. 4) With the mixer set on low, mix in the flour, baking powder, and salt. When almost all of the flour is incorporated, add in the M&Ms. 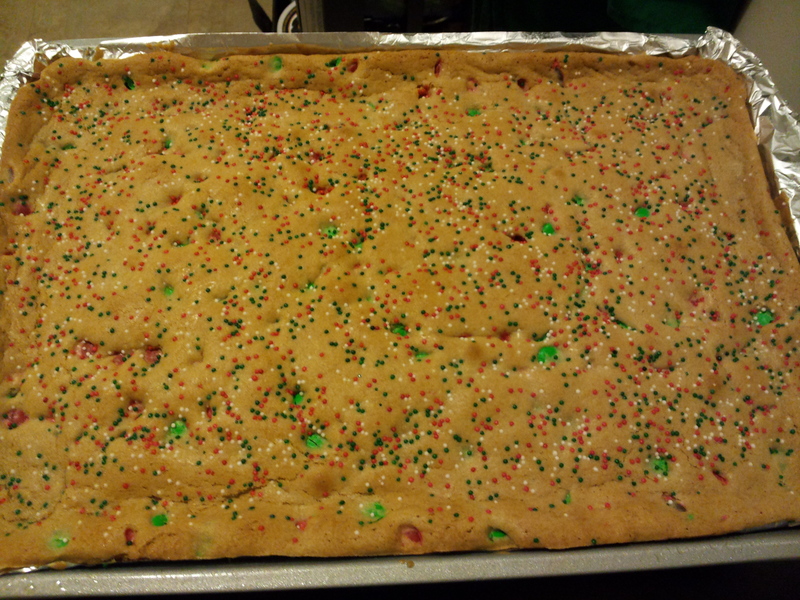 Switch to stirring with the rubber spatula and fold in the M&Ms until they’re evenly distributed. 5) Spread the batter into the prepared jelly-roll pan. Sprinkle with sprinkles! 6) Bake in the preheated oven for 16-20 minutes, or until just starting to lightly brown.